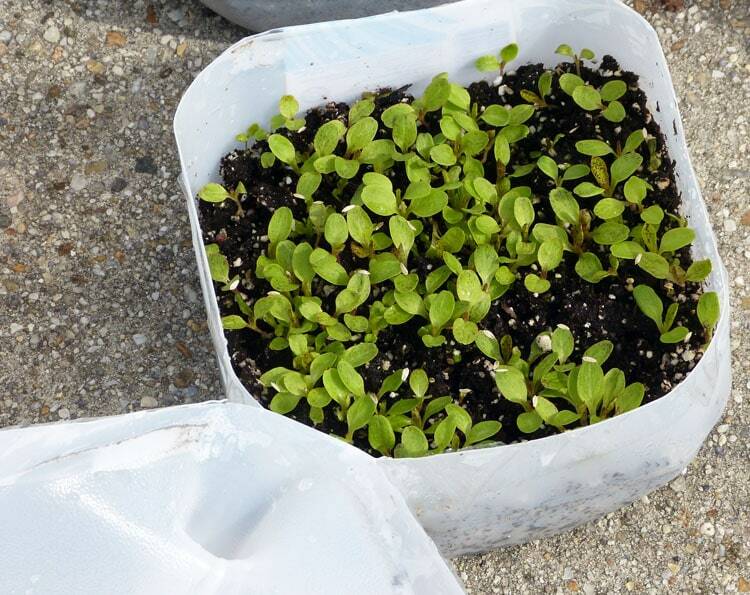 I received an email from a reader this morning who planted lettuce via the wintersown method and wanted to know if they planted the right number of seeds per jug or bottle. 9 seeds were planted in each of 4 jugs. Also used were four 2 liter coke bottles in which they planted 4 seeds each. There are no set rules on the number of seeds per jug and you can pretty much do whatever suits you. For those new to starting seed in a container I’ll give you some examples of what I do — and make some comments regarding each — so you can better determine what might be best for you. I’m a lettuce lover and probably start a lot more lettuce than most. I’ve already planted 17 jugs and I still have many more varieties to plant. You don’t have to stick to planting a small amount like 9 seeds, but it’s good not to overdo the number of seed either. I’ve done that in the past and the lettuce was just too thick and didn’t do as well. This amount (shown below) seems to be the perfect amount for me to plant per jug. For me – this is just the right amount to plant in a jug. You might want to plant less per jug than I do. Pulling lettuce seedlings apart carefully is not too difficult and doesn’t — in my experience— harm its growth at all. Like all seedlings they need a few days to reestablish themselves, but they do great once they get adjusted. If you’re new to lettuce or if you don’t use your lettuce until it’s fully grown—- I know you must be thinking — “how in the world does she eat all that lettuce?” Answer: I’m a grazer. I start picking lettuce leaves when they’re two inches and I keep right on picking every day until all is said and done many months later. 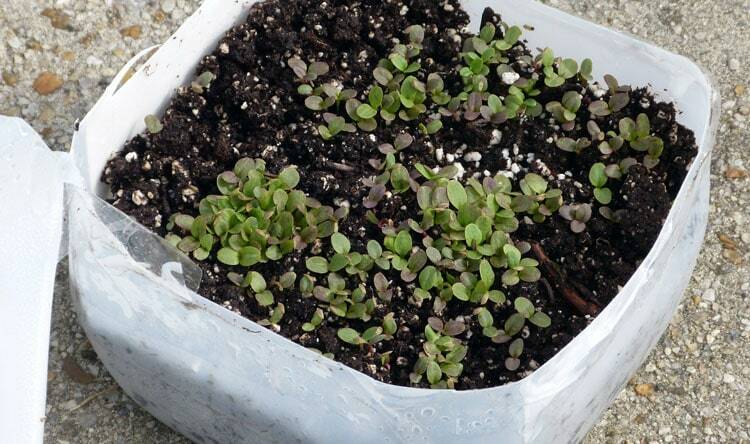 When I plant radishes, beets, bok choi, or spinach — I usually space the seed about 3/4″ to an inch apart — although they don’t always come up spaced as planted. I think they need a little more room than lettuce. Also, I find they’re easier to transplant when there’s a little space between each. Bak Choi seedlings. I like to transplant at this size although they always look so tiny and frail. With warm weather crops (which I’ll start sometime in March) like pepper, tomatoes and eggplants — I start 3 per jug. That way they can grow nicely for a while without being too crowded. If you’ve watched Batman — you’ll know it’s always good to have backup! Another thing to consider when determining how much to plant is how much you might lose. Whether you direct seed to the garden or start your seed in containers inside or via wintersown —- there’s always the chance of loss. Sometimes I feel that I’ve lost as much lettuce as I’ve grown. Especially for the past 3 or 4 years I’ve lost a lot when planting for fall. Year before last I must have planted 5 times before the lettuce finally made it. I’d plant one day and it was gone the next. Slugs probably. You always have to think of that in advance if you want a constant supply of lettuce. Plant a bit more than what you think you’ll need. Always have backup! 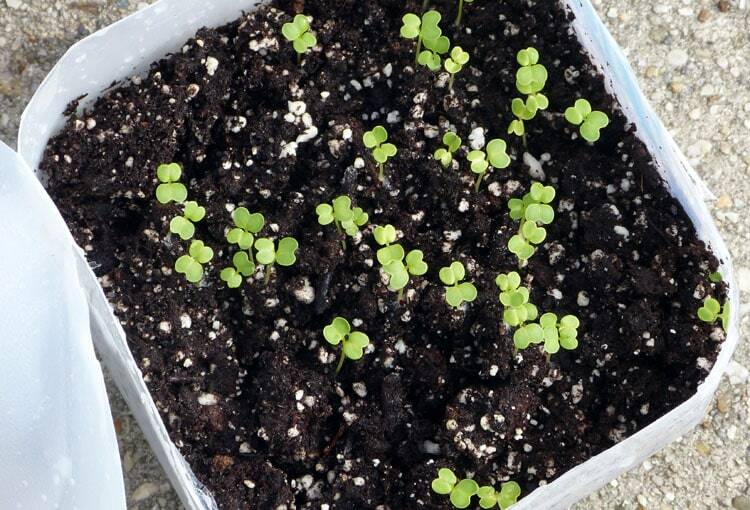 When to transplant seedlings to the garden. One of the nice things about wintersown is that in almost all cases plants will hold until you get to them. 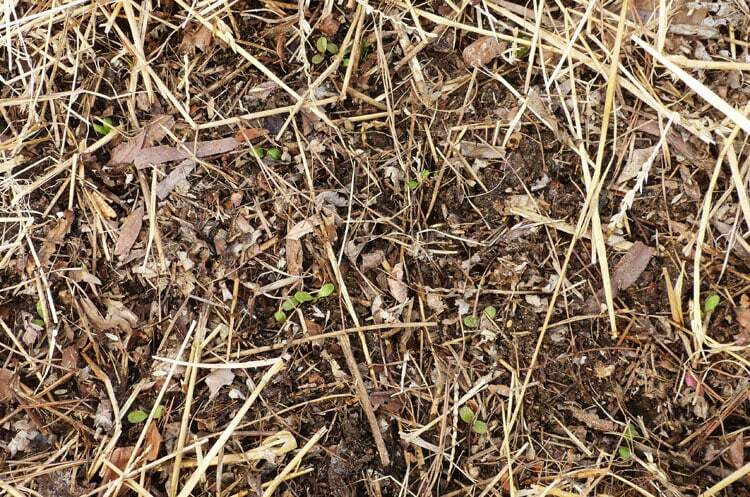 But by the time we have lettuce germinating — we’re anxious to get it the garden and get growing. I think the quickest I’ve ever gotten the lettuce babies “outta there and into the ground” was within a week after planting! And yes — the seedlings were very tiny. It did fine — but that probably was pushing it a bit. I’ve transplanted lettuce this small. This size is just about perfect in my opinion. If you look at the center of the seedlings you can just see the real leaves starting. I don’t pay much attention to what I read about waiting for the first two true leaves before transplanting seedlings. So far this year, I’ve not transplanted anything that had its true leaves. This will change because as time passes — some jugs will sit and wait for me until I have time — so the seedlings will be larger. The lettuce I transplanted a couple of weeks ago did not have true leaves but it still looks good. I could just about see the real leaves starting to develop when I looked at it today. Look closely to see this lettuce that was transplanted into the garden a week ago. For some reason I think bok choi, radishes and turnips do better being transplanted when they’re pretty new and small. It’s not a hard and fast rule for me, but I like to get them in the garden when they’re up about 3/4″ to 1 inch. In spite of what you might read, seeding and transplanting rules are not that fixed. With this information under your belt, use your best judgement. As you go along, you’ll get a feel for what works best for you. Since I live in NC I know the weather this year has been unpredictable. I noticed that when you planted you had (straw?) around your plants. Was this enough since we have had late snows and bitter cold this year or did you use something else to protect your plants. I remember you said something about row covers once and was wondering if you also used them or were the plants hardened off enough to withstand the unpredictible weather. Bok Choi DOES look very small, but I think getting it out early is key for me in my garden. It will not stand a chance in April when we have those spells of hot weather that I (at least) have had in my garden in past years. All my cool weather stuff bolted in a week of 80 degree weather during the last two years, and that was the end of them. This year I have other areas ready to plant that don’t face due South, so that’ll help. Also, I have set up a spot where I can grow arugula, bok choi and cabbage under a net to keep the cabbage butterfly out. I won’t grow a brassica that is not protected from the butterfly this year. Last year I spent lots of time picking off those green caterpillars, and they won the battle in the end. New year, new tactics. Thanks for the comparison pictures, I always enjoy seeing how similar things are doing in your garden. Thanks Theresa for expounding in detail and photo. I was concerned about root damage from separating and transplanting. Now am free to worry about other things! I had hoop tunnels for things planted in the garden this winter. Pictures were in a post — can’t remember which. When I have time to find the link I’ll come back into this comment and add it for you. The seedling in this picture were just transplanted a week ago. They were wintersown and wintersown things are already hardened off. Just FYI — lettuce can easily take temperatures to 28 degrees. Anything lower and you run a risk of setting them back if not covered. I think in my area of Virginia — freezing temperature will be above 28 as we head into spring. You have great ideas and really wear your thinking hat! Glad to hear that you think getting Bok Choi out early is the key to its success. I felt that — but didn’t know of other’s experience. Glad to be of help Frank. I think a lot of gardeners worry about the same thing. I appreciate your bringing the concern of how many seeds to plant to my attention so I could do a post on it. Let me know how your lettuce does. Hi Theresa…The cabbage butterfly has been showing up in my garden recently and tho I use floating row covers to protect my brassicas from their offspring, I never thought of using garden net to protect them instead. Great idea! Thanks to Sandra, for the tip. Fabulous! Thanks so much Theresa! I did the wintersown method for the first time last year and it was STELLAR! It made the season longer too. The wintersown crops were ready straight away. Then, I came after them and planted seeds directly in succession providing young lettuce once the heat came in – and with no shade – that was such a bonus! Thank you for sharing such great secrets! I LOVE the wintersown method! Perfect!!! Thanks for the confirmation, Bearfoot Mama! Patricia – the last picture in this post shows the hoop tunnels I use. I sow about 16 seeds per jug. If I get the seedlings transplanted early in the garden or for that matter direct seed them, I find that I have uninvited guests(roly poly’s) feasting away on what would have been MY lunch! Sowing lesser number of seeds allows me to let them hang in the jug a little longer till they grow to a size when the roly poly’s seem to leave them alone. I did do an experiment and direct seeded the veggies that I also sowed in the jugs. While the direct seeded veggies looked all chewed up, then ones in the jugs are doing well. While I have read that Sluggo Plus is good for getting rid of the roly poly’s, the active ingredient (spinosad) also apparently eliminates the good bugs(bees) and so its a no no for me. Excellent input Aparana! Thank you for taking the time to post. This is one of the reasons that I start seed via the wintersown method too —- they have a chance to outgrow the roly poly’s. This year I noticed that the only product on Garden’s Alive site is Escargo. Assuming that it is the original product — and contains only iron phosphate — it’s ok to use. Also I saw it on Amazon. Thanks for the input Theresa. I didn’t know that escargo/sluggo would work on roly poly’s. I will try that. Sorry I was not clear Aparna. The regular kind (the kind that is ok) will not work on roly polys. Only the kind with the spinosad works on roly polys. Which of course — does us no good. We just had oranges after dinner tonite. I!m heading off to the garden RIGHT now! Thanks for the info, Theresa. Let me know how you do Aparna! After a particularly cold couple of days, I notice heaving in the containers. The potting mix has deep furrows in it, and the surface is bumpy. I often wonder if I should come along and water it flat again, or just leave it. Usually, I don’t have time to water, but I wonder if you do anything about this heaving. Perhaps you have not had this? I don’t bother to tape my containers, just slide the top down inside the bottom, so perhaps if I taped I wouldn’t have this. I’m not sure even how much of a big deal it is in the end. Sandra, I have not had this happen —- at least I have not noticed it in any of the jugs I’ve looked in. After I tape them closed I pretty much ignore them until after I see some “green” growing when I peak in the top. I tape my jugs closed —- I don’t feel comfortable leaving them open. Maybe it doesn’t make a difference —- maybe it does — I don’t know. If I were in your position — I don’t think I’d water again — until or unless I was really sure the medium was bone dry. I’d be most interested in knowing the outcome, what happens and how you handle it. After thought: You know — one the reasons they say to mulch garlic is to prevent heaving. That makes me think that your planting mix is heaving because it’s exposed too much. It might be that taping the jugs closed would have prevented this. Seems to me it’s the same principle as putting mulch on beds in the garden to prevent heaving. I did try the orange peels and they DO help. I didn’t see a difference the first couple of days, but then I did see a few roly poly’s and slugs just beneath the peels. No doubt I will continue with this option. Thank you for a simple solution. Thanks for the update Aparna. I think you’ll have even more success as the weather warms! I’ve been winter sowing early crops and have a question. If I start my seed in a soil-less medium how long will the young plants thrive without other nutrients? I’m thinking ahead to tomatoes and peppers. If I start them in March, will I need to transplant them into soil before time to set them out in the garden? In past years I’ve started seeds in the house under lights. They germinate well and even with the lights a few inches from the seedling tops seem to just “hang out” after a certain point and don’t grow much until I put them in the garden, where they usually take off. This year I’m going to try the winter sown method hoping my seedlings will grow better? I just sent you a personal email — just in case this does not fully answer your question. You’re in Tennessee so I’m not sure your zone without looking it up but here in Virginia (zone 7a/7b) I start tomatoes, eggplants and peppers in mid March through the first of April. Cukes and squash in April and May. On March 15th I filled the bottom half of two jugs with my grow mix and added about 1/8 cup of compost to the mix. 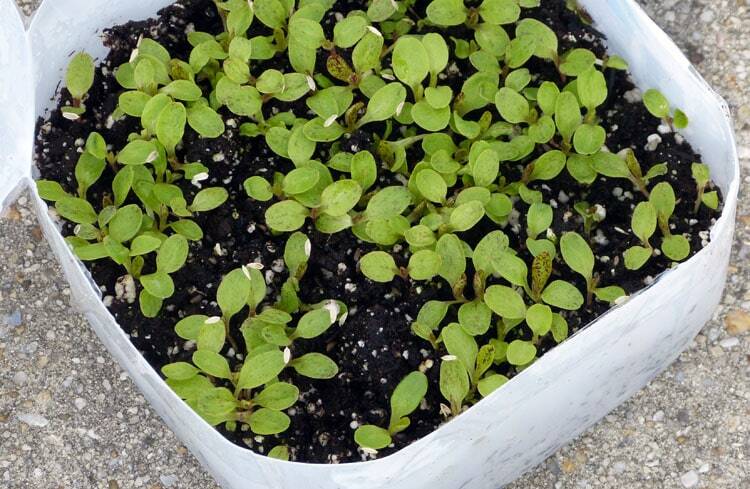 Since my grow mix contains nothing for the seedlings to feed on, the compost will give the seedlings food and allow them to grow larger than if they were in grow mix alone. I planted about 4 seeds of one variety in one and 3 seeds in another. Taped the bottom part of the jugs to the top parts. I put the jugs on top of the washing machine in the porch until the seed germinated. As soon as it did, I moved the jugs outside. When I took the tops off the jugs and couldn’t have been more pleased. They looked fabulous! Cool weather crops like brocolli and cabbage should also grow nicely if you use the same method outlined above even though they are started earlier. I ended up planting one or two tomato, pepper or eggplant seeds per jug to allow plenty of room for growth. Wintersown makes for very strong plants and they get plenty of natural light that way. Not to mention they will basically be hardened off by the time they are transplanted to the garden. If below freezing temperatures are forecast after the “hot weather” plants are outside I either use a row cover fabric over the jugs or one of my makeshift coldframes. Gives them extra protection. Crops like beets, spinach, and lettuce stay relatively small in the jugs, but that should not be a problem since they can be planted out during the first nice spell of weather and then cover with a light layer of mulch to protect them when or if it turns cold again. PS. Plants can survive a long time in grow mix without nutrients. How long depends on the plant. Those peppers I mentioned had no nutrients in that grow mix. It’s easy to take precautions against possible failures by just adding that little bit of compost to the grow mix.